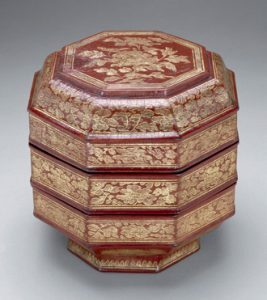 A lacquer box of octagonal form, constructed in three sections: a base section supported on a tall, slightly tapered foot, a middle ring section with a drop-in tray, and a lid with domed sides and a flat top. The box is decorated in a combination of painted and engraved (qiangjin) techniques. 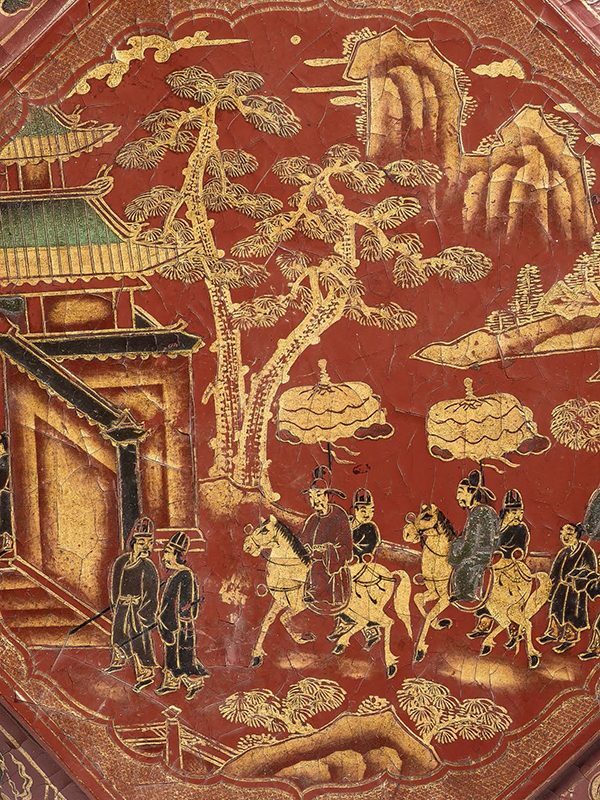 The flat top is painted in coloured pigments and gold with a detailed scene of two officials on horseback with their entourage returning to a pavilion set amongst rocks and trees. The domed sides of the lid are decorated in a similar manner with eight shaped panels, each containing a mythical animal, above a band of similar panels containing peonies on leafy branches. The middle ‘ring’ section has eight scenes of figures at leisure in landscape setting, whilst the peony panels are repeated on the bottom section. Two bands of stylised flower scrolls decorate the foot. The red and black lacquered drop-in tray has five compartments, the central one is of quatrefoil form. The interior and the base of the box are lacquered black. 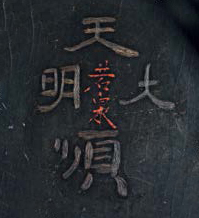 Four character marks reading Da Ming Tianshun are scratched into the inside of the base section, the drop-in tray and the inside of the lid, with further characters in red lacquer, reading Wakaizumi, probably Japanese collectors marks. The box is contained in a Japanese wooden box. The spurious marks on this intriguing, finely painted lacquer box are those of the Ming emperor Zhu Qizhen (1427 – 1464) who twice ruled China, first as the boy-emperor Zhentong from 1435 to 1449 when he was imprisoned by the Mongols, and secondly, after deposing the emperor Jingtai, under the reign title of Tianshun from 1457 to 1464. As the marks are scratched only fairly lightly into the lacquer it cannot be assumed that the box actually dates from this period, although it does seem somewhat peculiar that the piece was at a later stage ascribed to such a short and relatively obscure reign. 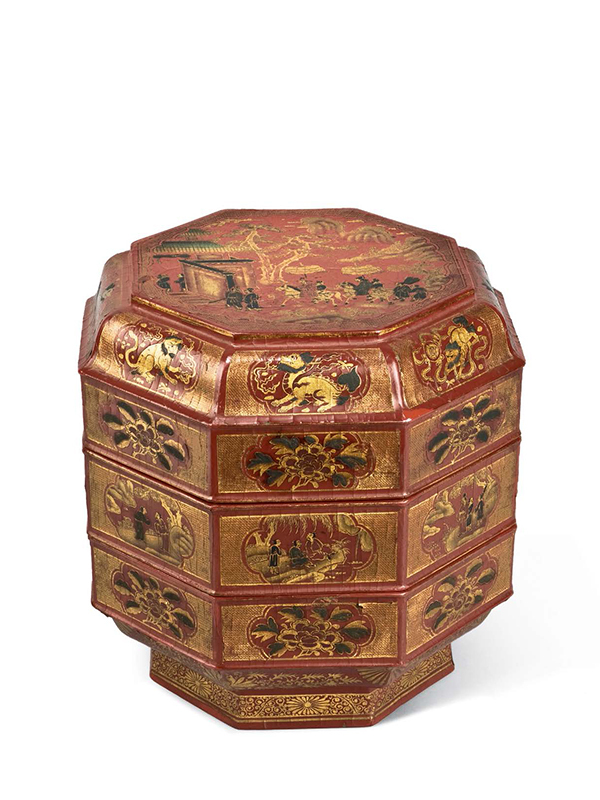 The octagonal shape of this beautifully preserved lacquer box, its unusual construction with a middle ring and the technique of decoration closely compare to those seen on a slightly smaller Chinese tiered lacquer box in the Arthur M. Sackler Gallery in Washington D.C., which is dated to the 14th or early 15th century (fig. 1). However, the different techniques and style of painting employed on the present box bear closer resemblance to lacquers ascribed to the Ryukyu Islands, situated off the coast of Taiwan, just south of Japan (the area is known today as Okinawa Prefecture). The Ryukyu Islands held close connections with China during the Ming dynasty, and its lacquer industry, heavily inspired by China, emerged probably sometime in the 14th century. The technique used for the decoration of the borders on the small panels on the sides of this box is known as qiangjin (engraved gold). This technique, in which an object is repeatedly coated with layers of lacquer after which lines are engraved into the surface and, while the lacquer is still sticky, gold powder or gold leaf is pressed into the lines to fill them, originated in the 14th or 15th century in China, later becoming popular also in Ryukyu lacquers. The painted technique used in most of the decoration is a type of oil painting in which pigments are mixed with wood oils to give a wider scope of colours. It is known in Japanese as mitsudae. A 16th century circular tiered box decorated entirely in qiangjin technique, its drop-in tray with very similar divisions, is in the collection of the Urasoe Art Museum in Okinawa Prefecture. A 17th century lobed tray in the same collection is painted in closely comparable manner with figures in a pavilion, set in a landscape with similar pointy rocks and pine trees. A 17th century oval lacquer footed tray from the Irving collection at the Metropolitan Museum in New York is painted in a very similar manner with a scene of an official on horseback returning home.